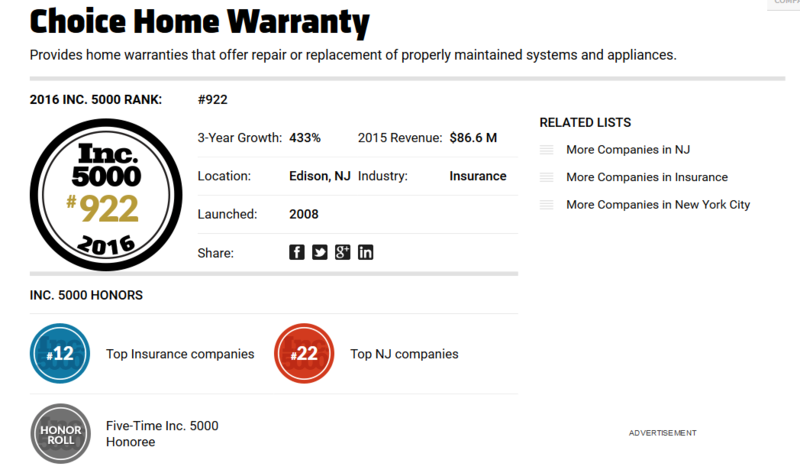 Edison, NJ — Choice Home Warranty is once again honored to be a part of the Inc. 5000. For five consecutive years, Choice Home Warranty has been among Inc.’s list of the 5,000 fastest growing private companies in America. Choice Home Warranty is ranked #922, breaking the top 1,000 for 2016. Inc. ranked Choice Home Warranty based on the company’s 433 percent three year growth. In its fifth year on the Inc. 5000 list, Choice Home Warranty is now on the Inc. 5000 Honor Roll. Ranked #12 for insurance companies, Choice is joined by leaders including Chelsea Financial Group, E-Telequote Insurance, Honor Capital, and Connect Assistance. Choice is also #22 for top New Jersey companies, again among Chelsea Financial Group as well as MP Consulting Services, Eduficcient, and Capital Advance Solutions. The Inc. 5000 is a ranking of America’s fastest growing private companies. Choice Home Warranty is proud to once again be a leader among America’s most inspiring small businesses and entrepreneurs enjoying significant growth and success. Choice Home Warranty is a home warranty company founded in 2008 and based in Edison, NJ. Learn more about Choice Home Warranty on the CHW Inc. 5000 profile. Please contact kelley@choicehomewarranty.com for more information about Choice Home Warranty’s inclusion on the 2016 Inc. 5000.